THINGS KEEP GOING WRONG FOR SHELL’S ARCTIC DRILLING PLANS | "Global Possibilities"
Shell’s Big Awesome Billion Dollar Arctic Drilling Adventure is not, so far, going exactly as planned. Crew members Friday discovered a hole – 39 inches long, a bit less than half an inch thick – in the hull of an ice-breaking vessel meant to protect its operations in the Chukchi Sea. “Any impact to our season will ultimately depend on the extent of the damage,” said Shell spokesman Curtis Smith, adding that he doesn’t believe operations will be delayed. 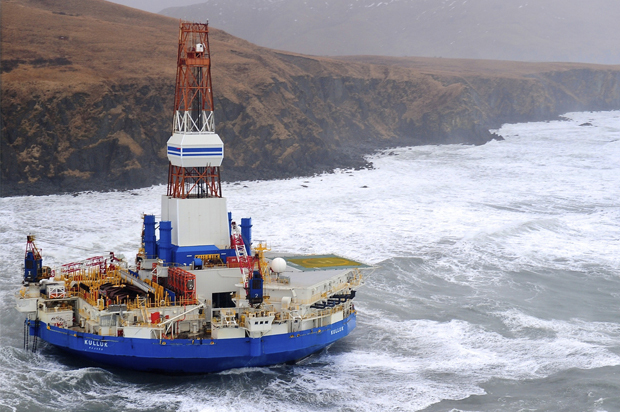 But according to FuelFix, if the Fennica misses this season’s brief drilling window, Shell will probably have to apply for a new permit with regulators at the Interior Department. This isn’t the only trouble Shell’s run into as it prepares for the dangerous mission of drilling in Arctic waters — and that’s not even counting the falling price of oil or the Seattle activists protesting its every move. Last week, the federal government informed the company that its plan to drill two simultaneous exploratory wells in the Chukchi rain afoul of environmental protections for Pacific walruses and polar bears, meaning it’ll have to cut down its activity by half. And while Shell’s already committed about $1 billion to the project, it’s still waiting on more federal permit to give it the final go-ahead. Small mishaps aren’t necessarily the making of an Arctic disaster: although the hole poses “an unfortunate potential setback,” Smith was at pains to emphasize, it “in no way does it characterize the preparations we have made to operate exceptionally well.” Heck, most of Shell’s notorious 2012 catastrophe — for which it was recently found to be entirely at fault — was nowhere near as bad as it could have been. But incidents like this sure don’t inspire confidence. As journalist McKenzie Funk, who wrote an e-book about the whole debacle, told Salon, the lessen to be learned from that is that in an environment as high-stakes as the Arctic, each little thing that goes wrong has the potential to escalate quickly to a situation that not even the most well-prepared contingency plan can account for. The drilling season may be short, but it’s sure going to feel long from the perspective of those holding their breath.